Cruise ships dock or anchor at different locations according to their size. In general you wll be docked within a short walking distance from town. It seems Mozambique have recently changed their Visa conditions and it appears that they can no longer be obtained on board - Dont know how long that will last as it means most visitors from non Southern African Development Community (SADC) countries will need a visa before travel and Mozambique do not have consulates in many countries and if there is a consulate, fees will expensive and will take a lot of effort. Before you book a cruise, please check with your cruise line! The Fort of Maputo is the most popular attraction in the city. It is alternatively known as the Fort of Lourenço Marques or the Fortaleza da Nossa Senhora da Conceição. Built between 1851 and 1867, the fort stands on the site of the original mud and pole stockade. The fort houses the remains of Ngungunhane, last great chief of the Nguni tribe, and still contains plaques glorifying Portugal's colonial conquests as well as artillery. Attracted by the rumors of pearls in the 1700s, the Portuguese established the capital city of Lourenço Marques, or Maputo as it is known today, in the southern reaches of the country. It became one of the most stylish cities in Africa, with broad avenues lined with jacaranda and acacia trees, sidewalks paved with mosaics, tall buildings and a unique Mediterranean/African atmosphere that attracted a wealthy cosmopolitan crowd. The civil war left the city in a state of disrepair, and although still tainted by shabbiness, Maputo is recovering some of its former glory, and today the bustling capital reveals many Portuguese-style colonial buildings, and offers culture and old world charm, along with numerous places to enjoy Mozambique's famous peri-peri prawns and cuisine. The National Art Museum has a small but good collection of Mozambican art, including several large canvases by the world-renowned Malangatana. 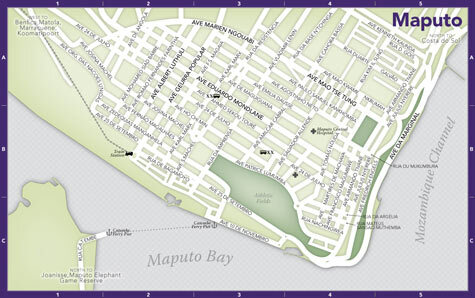 Maputo is small enough that visitors can get around quite easily on foot. The streets are laid out in a grid, but road signs are few and far between so a map is a good investment. At daytime, violent crime is not a problem. However, occasional pick pocketing attempts do occur and are almost guaranteed on busy streets. At night, it is better not to walk around alone. Metered (yellow-roofed) taxi longer distances or at night but agree to a fare beforehand as many don't have meters. Visit some beautiful beaches, such as Catembe and Ponta d'Ouro. It is very jovial in these atmospheres and it is not dangerous in the least bit.Ponto D'Oura and Ponto Malongane have some beautiful scuba-diving spots, with either campsites or chalets right on the beach. Stroll along the Avenida Julius Nyerere, browsing the boutiques, vendors, and restaurants. Look for African waxprint and woven fabrics, beautiful wooden boxes and picture frames. The currency of Mozambique is the Metical (plural: Meticais, pronounced 'meta-caysh', abbreviation: Mts.). Prices are often given verbally with the thousands dropped, e.g., Mts 150,000 would be 'one hundred fifty'. In all towns you will find cash dispensers (ATMs) which accept all major credit-cards. Official language Portuguese. Most educated Mozambicans speak English. Most businesses and shops are open between 14h00 and 18h00 on Mondays and 08h30 and 13h00 and 15h00 and 18h30 on other weekdays and Saturday. Shops and businesses are closed on Sundays.